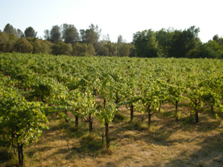 Le Casque was founded with one goal in mind – to produce small lots of wine from the absolute best vineyard sources in the Sierra Foothills and surrounding areas. We embrace the time honored French tradition of blending several different varietals together to create a wine that is greater than the sum of its parts. We also seek to create varietal wines that display special character in their own right. This has been our vision for Le Casque from the very beginning – great vineyards, exciting blends and varietal wines that show true character. In the southern Rhone valley of France (one of our favorite wine producing regions), it is not uncommon to find wines blended from several different varietals. Syrah, Grenache and Mourvedre predominate in the reds, while Roussanne, Grenache Blanc and Marsanne are common in the whites. In all, there are over 20 grape varieties used in this region. This provides winemakers with a wonderful pallet of flavors to choose from when fashioning their wines. While some of the grapes, like Syrah, are familiar to most American wine drinkers, others, like Mourvedre and Grenache, are less so. They are all world class in their own right; however, when blended together they can make some of the world’s truly great wines. We seek to make blended wines of this caliber, with all of the complexity of aromas and flavors that these wines demonstrate.